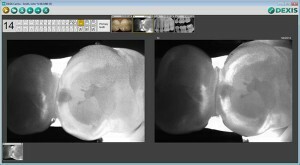 This amazing dental technology gives us almost x-ray vision with no radiation exposure. How does it work? By shining wavelengths of light through the tooth, we’re able to see all the fine details. CariVu is completely safe and perfect for our patients who may prefer to avoid x-rays. In fact, it is often more diagnostic than an x-ray for seeing cavities and cracks in your tooth. We are one of the only Boulder dentists to offer this service; we are very, very excited to have added this to the practice!